Ballston Quarter is now set to feature a full complement of restaurants with outdoor patios in the new development’s plaza, despite some reticence from Arlington planning staff. 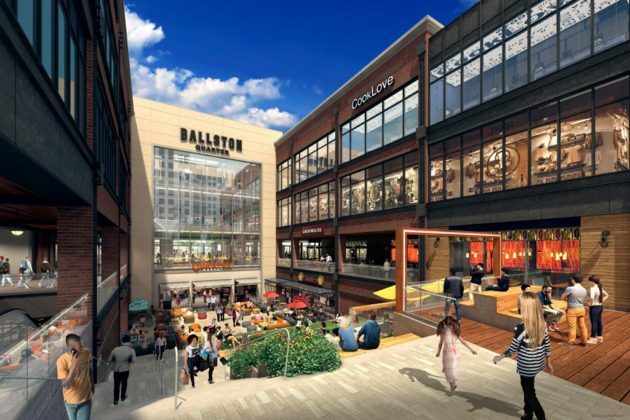 The newly renovated Ballston Common mall now has the county’s go-ahead to welcome six restaurants with outdoor seating areas to its west plaza, along Wilson Blvd, after the County Board unanimously approved some permit changes at a meeting last Tuesday (Sept. 25). The decision to allow the full range of patios, however, ran counter to the recommendation of county staff. They raised concerns that one set of outdoor seating, located to the left of plaza when seen from Wilson Blvd, would be particularly disruptive to people walking through the development. Evan Pritchard, an attorney for Ballston Quarter developer Forest City, argued that the full range of outdoor seating is a “key ingredient of the plaza area” and dismissed concerns that it would somehow impede the flow of pedestrians through the development. 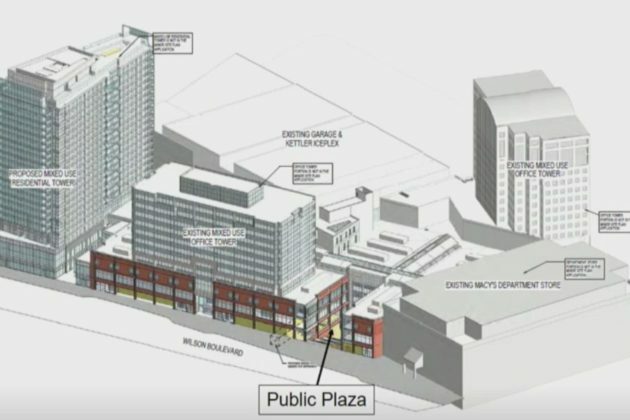 “Most people heading to Ballston Quarter will never encounter the plaza unless they want to,” Pritchard said, pointing out that most visitors will access the development either via a pedestrian bridge connecting to the area’s Metro station or through the mall’s entrances on Wilson Blvd and N. Glebe Road. The plaza itself is designed for outdoor events, and will connect to the development’s new “food hall,” Pritchard added. “A destination is most attractive when it’s busy and energized, not empty and desolate,” Vihstadt said. County staff compared Ballston Quarter’s plaza to Rosslyn’s Central Place, just across from the area’s Metro station, which is a heavily trafficked open space between several large skyscrapers. But Board member Erik Gutshall didn’t view that as an apt comparison, arguing that the plaza is “not a streetscape where we’re trying to manage competing needs” as it won’t sit on Wilson Blvd itself. “I have confidence that Forest City will be able to manage this place to everyone’s benefit,” Gutshall said. The Board also laid the groundwork for approving another change to the plaza sought by the developer: the addition of two large LED “media screens” above the plaza. Forest City initially planned to withdraw its request for a permit for the screens, after Pritchard discovered that they might be a bit too far off the ground to meet the county’s zoning rules. Instead, the Board pushed off consideration of the matter until December, giving members time to tweak the ordinance and allow the new screens to move forward. 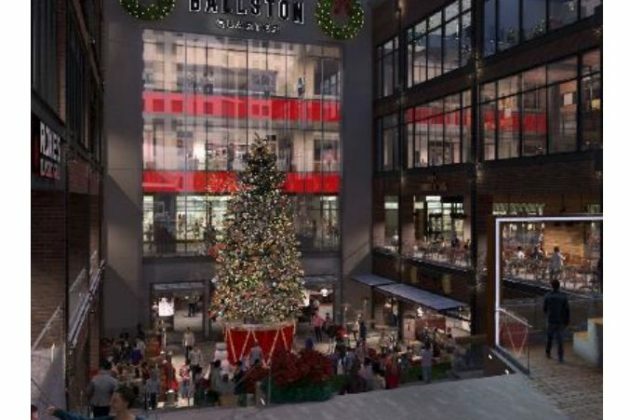 Ballston Quarter is currently slated to open in late October, after a brief delay, though Forest City expects its restaurants and retailers to open on a rolling basis over the coming months.